Josephine Veronica Dillon-Mosely | Lloyd Maxcy & Sons Beauchamp Chapel, Inc.
Josephine Veronica Dillon-Mosely, a longtime resident of New Rochelle, died on November 1, 2018. She was 81. Josephine was born on March 20, 1937 in Brooklyn, NY to the late Daniel and Dorothy (Ferrington) Dillon. Josephine was the first African American woman to graduate from St. Vincent Hospital Nursing School in Manhattan. 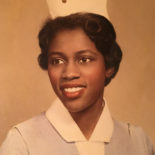 She worked as a private duty Registered Nurse for many years at the then Sound Shore Medical Center and Greenwich Hospital, Connecticut. Josephine received her Masters degree from Iona College and also worked as a family counselor at Pelham Children’s Center. Josephine is survived by her 4 daughters, Therese Mosely-Saunders, Colette Mosely, Sr. LaReine-Marie Mosely, SND, and Celine Mosely; her grandson, Amir Saunders; her son-in-law, Lincoln Saunders; her sisters, Jeanette Sandiford and Marie Dillon; and her former husband, William T. Mosely. She is predeceased by her daughter, Lucette Mosely and her sister, Akilah Abdus-Salaam. Visiting hours will be Tuesday, November 6, 2-4 and 7-9 pm at Lloyd Maxcy & Sons Beauchamp Chapel, 16 Shea Place, New Rochelle, NY. A Mass of Christian Burial will be celebrated on Wednesday, November 7 at 10:30 am at Holy Family Church. Interment will follow at St. Charles/Resurrection Cemeteries, Farmingdale, NY.